This time last year I spent a magical week in Prague. It’s a perfect time to visit – not too many tourists, wintry weather which fits with the scenery, lots of cultural things to go to ie opera, ballet, concerts and theatre – and you can get a table at any bar or restaurant with no hassle. We were there during Obama’s inauguration and spent a memorable evening with locals & foreigners at the American-run Globe Bookstore watching the historic event on a huge screen and celebrating with excellent local ‘champagne’. 1. 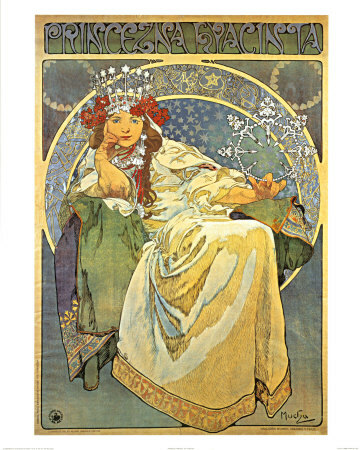 Indulge in the glories of Art Nouveau. 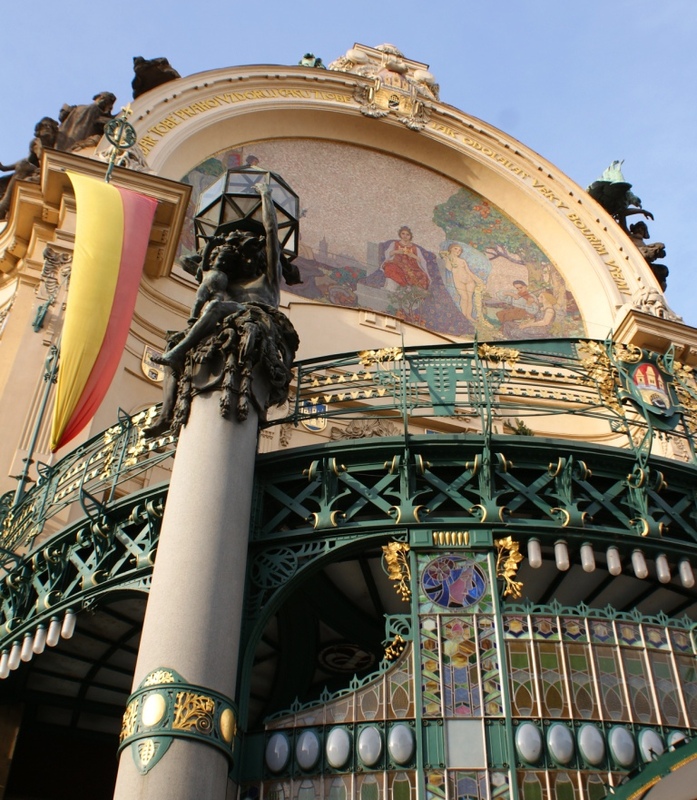 Visit the Mucha Museum and learn about Alphonse Mucha, one of most famous exponents of the form. You can find wonderful original examples of his work, including his Four Seasons posters and those he did for his Muse, the English actress Sarah Bernhardt. There’s a beautiful stained glass window by him in St Vitus Cathedral (See pic above) and many fine examples of Art Nouveau architecture and design all over the city. My favourite building was the Obecní dům (Municipal Building), a fabulously ornate concoction to delight the senses. 2. Walk around medieval Staroměstské Náměstí (Old Town Square) and look at the fantastic collection of buildings from over 400 years. 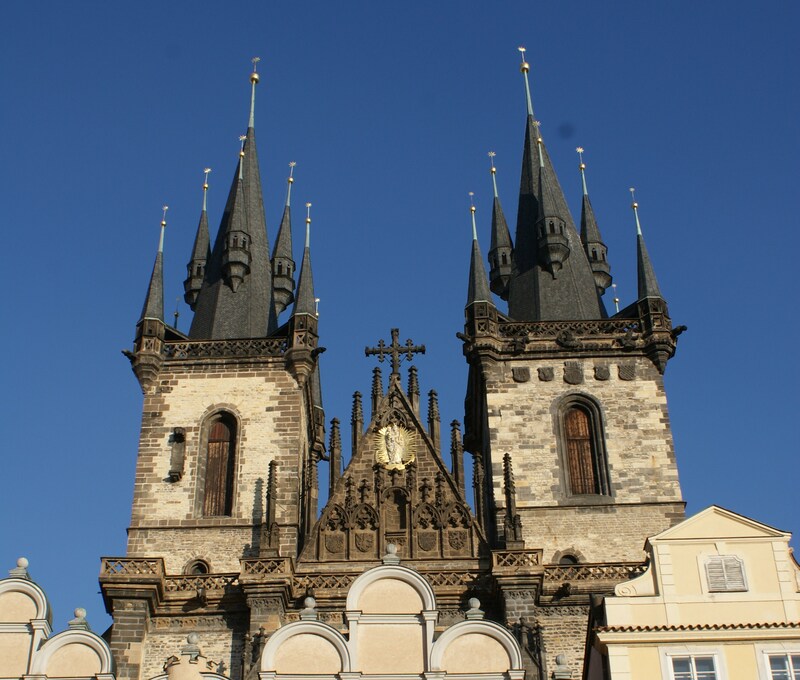 One of Prague’s most atmospheric Churches, Our Lady Of Tyn is beautifully silhouetted against the sky. Find a table at one of the restaurants (expensive but what a view! ), watch the world go by and wait for the most beautiful Astronomical Clock in Europe strike the hour. 4. For a slightly different perspective visit the The Vysehrad Cemetery Vysehrad, the burial place for many famous and important Czech people. 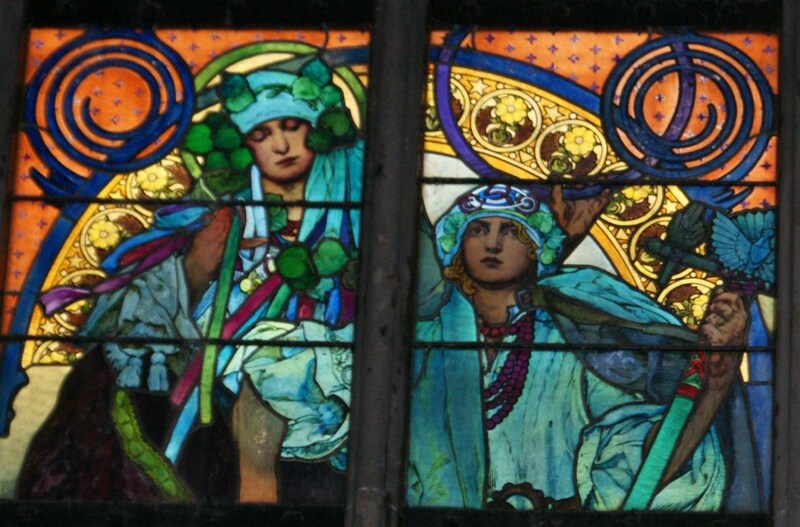 You’ll find the composer Dvorak just round the corner from Smetana and in the large Slavin Memorial many illustrious Czechs including the Art Nouveau artist, Alphonse Mucha (see above). The cemetary is in the grounds of the Vysehrad ‘Castle on the Heights’ and there are great views over the city from its ramparts. To get there, you can walk there along the river, get the Metro or try the excellent tram system. 5. 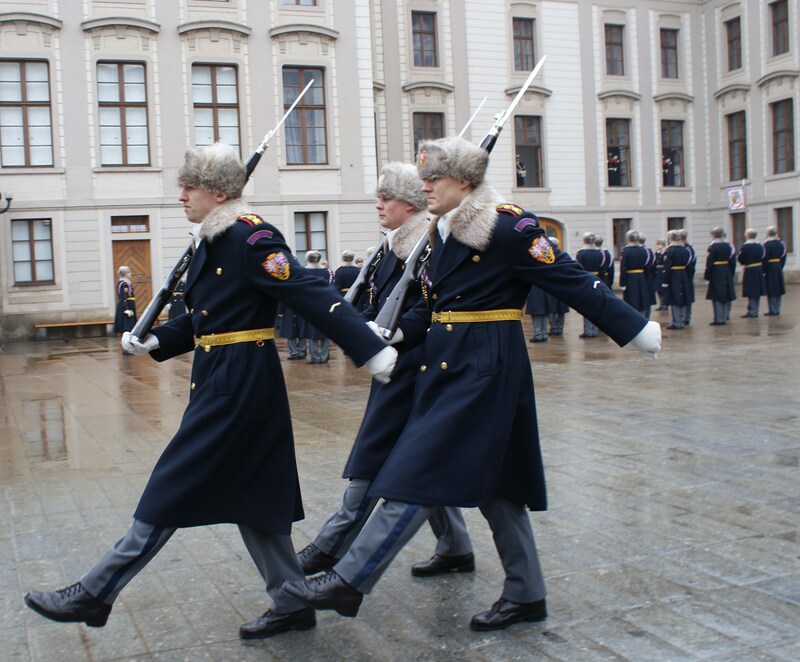 Watch the Changing of the Guard at Midday Prague Castle In the winter the Guards wear great-coats and furry hats (unlike their powder blue & decidedly fey summer uniform!) and at Midday when they do the Banner exchange, they march about to music that sounds vaguely reminiscent of the Thunderbird Theme tune. You can then go round Prague Castle, a glorious hotch-potch of buildings from different periods and also see the magnificently Gothic St Vitus Cathedral.